CHIANG MAI, Thailand, May 2 2013 (IPS) - At the age of 23, Gao travelled to Thailand to escape intense fighting in his native Shan State in the east of Myanmar (Burma) and possible recruitment into the Shah army. “When I arrived in Bangkok, I started working in a garment factory. We didn’t have proper food. I was surviving on a handful of rice and a half packet of ramen noodles,” Gao told IPS. The young boy soon fell very ill but could not afford to see a doctor. It was not until his co-workers pooled all their resources together and put him on a bus to the northern city of Chiang Mai that he managed to get a free consultation through a Shan temple. Gao was one of the lucky ones. Isolated by language and ethnic barriers, most migrants in Thailand lead secluded lives, unable to access resources or information that would help them secure their basic rights – such as healthcare, minimum wage, or proper food – in a foreign land. 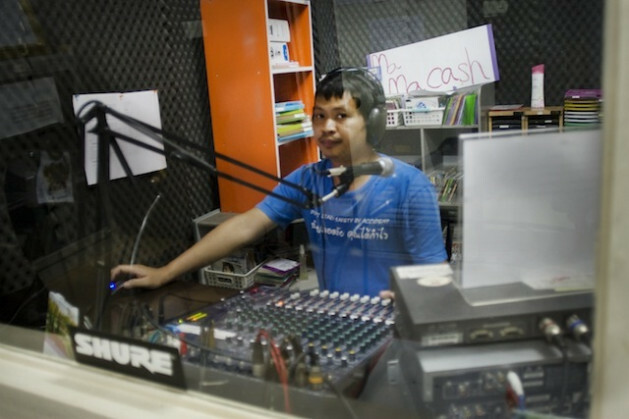 To fill the gap, a local organisation known as the Migrant Assistance Programme (MAP) has created community radio stations in Chiang Mai and Mae Sot, a town on the Thai-Burma border, which have opened the doors of communication for a silenced community. “Most of the migrant workers in Thailand, especially from Myanmar, come from various ethnicities – including the Kayin, Kayah, Shan, Mon, Rawang, Bama and Tavoyan – and speak different languages, so (our work) is really about breaking the isolation that many face when they come to Thailand to work,” MAP Director Jackie Pollock told IPS. The broadcasts go out in four different languages – Shan, Burmese, Thai and Northern Thai. Listeners phone in requests for their favourite songs, find out about MAP’s work or how to take advantage of current migration laws and policies. Most of the listeners are migrant workers from Myranmar who often take up what are locally referred to as ‘3D’ jobs (dirty, dangerous and demanding), and end up working on construction sites, as domestic workers, in the agricultural and fishing industry and in garment and textile factories around the country. Mae Sot, where one radio station is based, houses an entire industrial zone along the Thai-Burma border, where garment, textile and furniture factories swallow up scores of migrants the minute they cross the border in search of work. Women comprise the bulk of the workers in this town and are subjected to extremely poor working conditions for far less than the minimum wage, which is currently ten dollars a day. The radio station has penetrated this community, offering programmes on occupational health and safety, women’s rights and cultural issues. “Last year, we did three trainings with migrants who were interested in being broadcasters, DJs or journalists,” Burmese migrant worker and MAP community broadcaster Lan Moon told IPS. Originally from the south of Shan State in Myanmar, Lan Moon came to Thailand 25 years ago at the age of six with his aunt and grandmother to escape fighting between the Shan army and the Burmese government. He believes that radio forms a kind of “lifeline” between workers who would otherwise live and labour alone and whole communities that can offer support and information or simply commiserate about long hours or reminisce about home. According to Pollock, cultivating a community of listeners did not happen overnight. MAP spent many years conducting weekly visits to areas where migrants live and work to distribute information about health and childcare, and used word of mouth to keep migrants up to date with national policies that might affect their jobs. Now, in addition to the radio stations, the organisation has created 19 spaces along the border specifically for women to come together. “They organise themselves, sometimes invite speakers or hold discussion groups,” Pollock added. Currently there are an estimated 2.5 million migrant workers in Thailand. The vast majority originates from Myanmar due to confiscation of land, human rights abuses or a lack of jobs and economic opportunities back home. Although Article 2.2 of the International Covenant on Economic, Social and Cultural Rights (ICESCR), to which Thailand is a signatory, ensures the equality of rights between nationals and non-nationals, the majority of migrants here are subjected to poor working and living conditions, lower wages and long working hours. Registered migrants are also eligible for state health insurance schemes and are technically allowed to avail themselves of state medical services for a low fee. However, for most foreign workers, language barriers and the constant threat of discrimination or deportation hinders access to even these most basic rights. For people like Gao, MAP has not only been a source of relief in times of distress – providing meals, shelter and necessary documents — it has also provided him an alternate occupation. Following a crackdown on migrants in Chiang Mai, Gao says he “started volunteering with MAP’s crisis support group”.